Millburn, NJ — Dr. Harold Pollack, a dentist in New Jersey, and his practice have updated their CEREC software and camera to maintain their commitment to providing the most advanced technology and procedures available. The CEREC device is designed to create custom dental restorations in one appointment so that patients can have their teeth fitted with a long-lasting solution on the same day. With statistics from the American Association of Oral and Maxillofacial Surgeons (AAOMS) reporting that 69 percent of adults ages 35 to 44 have lost at least one permanent tooth, Dr. Pollack says providing the highest quality dental restorations and the latest technology is an essential part of his commitment to patient care. Developed by Sirona, the CEREC device is a computer-aided system used to produce individual all-porcelain restorations in a single appointment. Dr. Pollack says the new software upgrade allows him to enhance the imaging and precision of the device, while rebuilding his patients’ teeth in the most conservative, natural way possible. 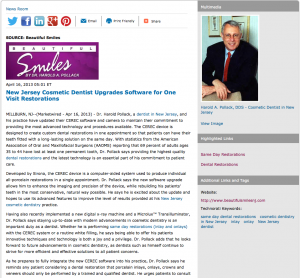 He says he is excited about the update and hopes to use its advanced features to improve the level of results provided at his New Jersey cosmetic dentistry practice. Having also recently implemented a new digital x-ray machine and a MicroluxTM Transilluminator, Dr. Pollack says staying up-to-date with modern advancements in cosmetic dentistry is an important duty as a dentist. Whether he is performing same day restorations (inlay and onlays) with the CEREC system or a routine white filling, he says being able to offer his patients innovative techniques and technology is both a joy and a privilege. Dr. Pollack adds that he looks forward to future advancements in cosmetic dentistry, as dentists such as himself continue to strive for more efficient and effective solutions to all patient concerns. As he prepares to fully integrate the new CEREC software into his practice, Dr. Pollack says he reminds any patient considering a dental restoration that porcelain inlays, onlays, crowns and veneers should only be performed by a trained and qualified dentist. He urges patients to consult with an experienced practice before undergoing any treatment, so as to ensure they receive the safest, most conservative and effective results possible. Located at 280 Millburn Avenue in Millburn, NJ, Beautiful Smiles by Dr. Pollack can be reached at (973) 947-4331. He and his team can also be contacted online via the website beautifulsmilesnj.com or facebook.com/drharoldpollack.